Do you have a tradition of eating hot cross buns on Good Friday like we do in our family? 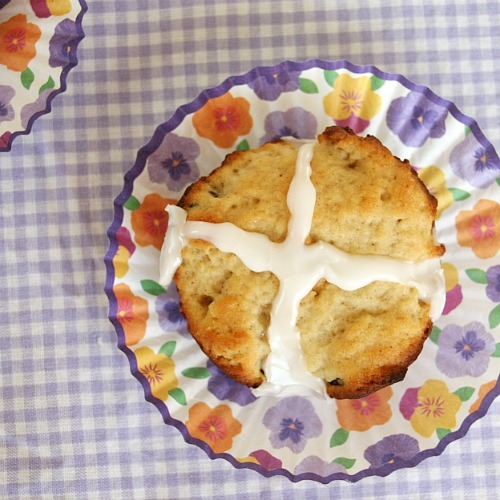 Every Good Friday I can remember as a child included eating delicious hot cross buns my mother had made that day. Smooth, round rolls of sweet bread dotted with raisins and crossed with a delicious glaze on top. They made the house smell good and I couldn't wait to eat them. 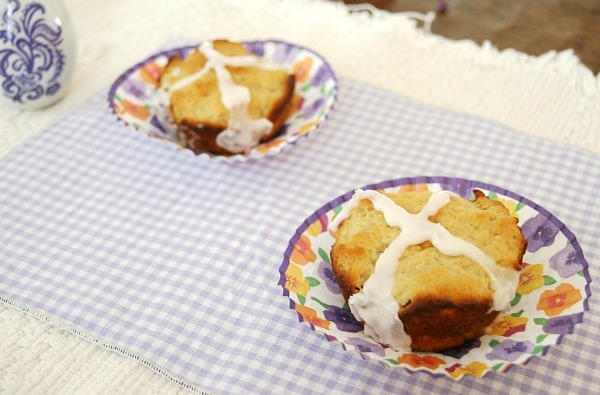 We'd sing the "Hot Cross Buns" song and talk about what the cross represented on the buns that special day. My mom is currently living in England, so she's getting the authentic treat right now and says the bakery windows are filled with these yummies. 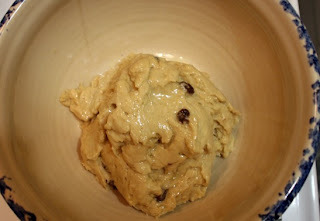 I've made different recipes of gluten-free hot cross buns over the last couple of years and I think this year I finally came as close to recreating Mom's originals from the Joy of Cooking recipe as I will probably get. Last year I played around with different flours but didn't get anything with a decent texture. They were more like bread-type cookies. This year I used the some of the same flours I use in my yeast bread recipe and had success. 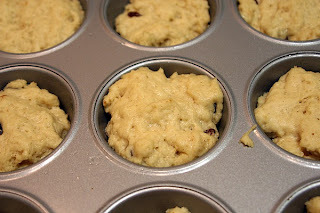 For these photos, I placed the dough in muffin tins to be sure they came out round. 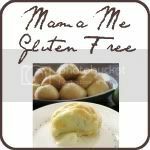 When I make these again on Friday, I'll attempt them on baking sheets in what will hopefully bake into nice round rolls (I'll try a tester first and use muffin tins again if they don't turn out). They don't look quite the same as my mom's, but the taste is definitely there. And it's definitely good! Another thing I like about this recipe is I used just a saucepan and wooden spoon. No mixer required! In a large saucepan, heat milk until hot but not boiling. In a small bowl combine warm water and yeast, let sit for a few minutes. Stir into milk mixture. Beat egg into milk mixture. Sift flours together and pour a small amount into the milk mixture, stirring with a wooden spoon. 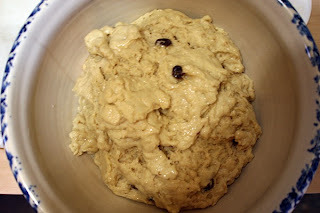 Continue adding a little at a time, beating with the wooden spoon, until it's all mixed. Continue to beat with wooden spoon for about a minute or so, until everything is combined well and a nice dough has formed. 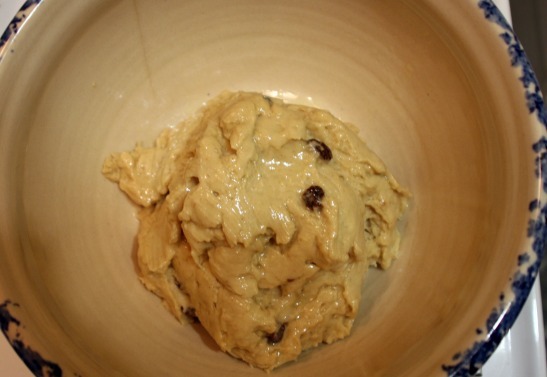 Place in a large greased bowl and cover with a damp towel. Set in a warm place to rise, about an hour, until doubled. If using muffin tins, grease them first and then place 18 equal portions into the tins. If you want to try shaping the buns yourself, grease baking sheets and round 18 balls to place on the sheets. Cover again and let rise in warm place until nearly doubled again, about 30 minutes. Bake approximately 15-20 minutes or until done. 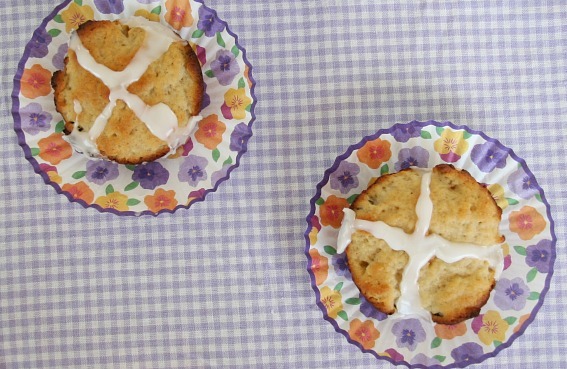 Let cool completely and then make crosses on top with the icing. To make the icing, in a small bowl combine the powdered sugar, vanilla and milk. Stir well to combine. If it's not thick enough to hold a line to form the cross, add a little more sugar at a time until it is. For my photo of beauty, I'm sharing another flower photo. 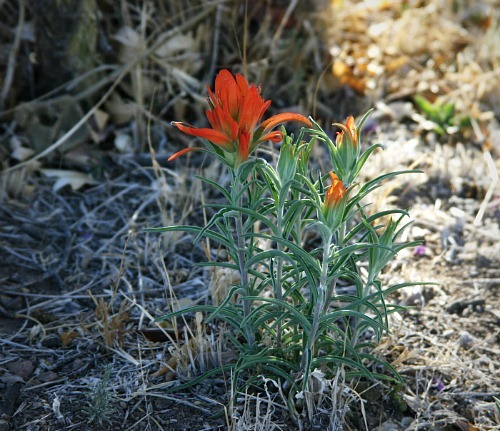 We have wildflowers blooming for spring - not as many as I'd like with the drought going on but enough to enjoy their beauty. I love the vibrant red and orange in the Indian paintbrushes. I hope you have a beautiful weekend, and Happy Easter! Thank you so much for including them, Shirley!